Almost 20 years ago, in 1991, the movie Beauty and the Beast made its debut in theaters. I remember going to see this amazing version of the "tale as old as time" when it first came out and marveling at the wonderful animation. Even high school students like myself at the time found the movie amusing and witty enough to become a favorite. I have fond memories of my friends and I sitting in the band room listening to the CD and remarking on the moving and expressive music. Beauty and the Beast is a wonderful story in itself, but this Disney production made it into so much more -- a powerful love story with magical characters in a wonderful musical form. And then there's Belle, a princess for every little girl to admire, an intelligent, adventurous book-lover with brown hair and brown eyes. The movie features a bookstore and a to-die-for, amazingly large library in the castle. Yes, I've loved Beauty and the Beast from the beginning. "Ohhh, isn't this amazing, /It's my favorite part because, you'll see /Here's where she meets Prince Charming /But she won't discover that it's him 'til chapter three!" 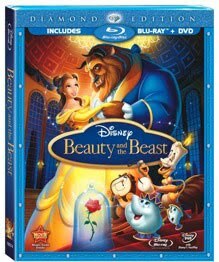 - "Belle"
Finally, after being locked in the Disney Vault for a long while, Beauty and the Beast is available once again for purchase, this time in the Blu-ray/DVD Combo Pack Diamond Edition. Disney released this newly restored version last week, on October 5th (the 2-Disc standard definition DVD releases on November 23). The Blu-ray Combo Pack includes two Blu-ray Discs plus a bonus DVD for regular disc players. Thanks to Disney, we recently had the chance to watch this newest Blu-ray version. I'm not going to rehash the synopsis because the tale is so familiar and the film so popular it hardly needs an introduction. Beauty and the Beast is one of Disney's most beloved and highly-regarded films, receiving two Academy Awards for music in 1992, three Golden Globes for Best Motion Picture, Best Original Score and Best Original Song in 1992, and two Grammy Awards in 1993. It was previously re-released on DVD in 2002. What this newest version brings to the plate is a brightly restored picture, a new audio in 7.1 Digital Surround Sound, and tons and tons of new behind-the-scenes stories and bonus features. 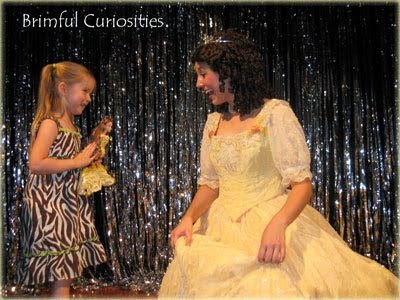 My daughter had the opportunity to watch a community production of the Broadway version of Beauty and the Beast this summer and has been patiently waiting for this movie to come out. My kids both enjoyed watching this new DVD (and hiding their eyes during the scary wolves and beast scenes). The restoration in this Blu-ray edition truly makes the pictures in the movie brilliant and clear. The French countryside never looked better. There are three versions of the film available for viewing on both the Blu-ray and DVD: the original theatrical release, a special extended edition that includes the previously cut "Human Again" musical sequence, and an original storyboard version that shows the film simultaneously with the original storyboard sketches. If you feel so inclined you can even watch the movie in a sing-along mode. All of that is well and good, but what I really enjoyed in this new edition was the bonus features. I spent several hours watching the informational features and learned much about the development of the film and the people that created the movie. Navigating through all the bonus features is a little difficult. The menu text is hard to read and the cobbled together organization leaves a lot to be desired. But, these background stories are truly fascinating and you can't call yourself Beauty and the Beast fan without seeing these features. The most interesting bonus in my opinion is the interactive "Beyond Beauty: The Untold Stories Behind the Making Of Beauty and the Beast." This piece-by-piece documentary is divided into several acts and is found on Blu-ray Disc 2. The creators discuss the rocky beginnings and an initial attempt in the 1980's, a much darker and non-musical version (The Purdum Reel), was completely scrapped. Thankfully, Disney changed directions and hired Gary Trousdale and Kirk Wise as acting directors and decided to develop it as a musical, hiring composer by Alan Menken and lyricist Howard Ashman, the same amazing team responsible for the music in The Little Mermaid. There's also plenty of information on the process behind the animation. I always wondered who created the Beast character (he's a combination of various animals) - it must have been extremely challenging to find the right balance between scary and lovable. Those passionate about fairy tales and renditions will enjoy the background information on Walt Disney's love of fairy tales and his silent Laugh-o-grams. The Broadway aspect is also discussed in features like "Full Circle to Broadway." Other fascinating features include the deleted scene, "Belle in the Library." The scene introduces four new characters: a bookstand named Oxford, a globe named Cambridge, a statue full of various quotes, and a telescope. This scene doesn't really advance the story and I can see why it was dropped, but it is still fun to watch. An alternate version of "Be Our Guest" shows that the famous song was originally sung to Maurice, Belle's father. This classic and beloved film is well worth owning. I'm so glad that Disney finally released this Blu-ray version and we're happy to put in a place of honor in our personal Disney DVD collection. You're tempting me to buy a third copy of this movie. I really don't think my husband would go for that. my boy has been known to poo poo girl movies but now that i'm thinking about it, the beast is pretty awesome. adding to my netflix now! thanks for the reminder.